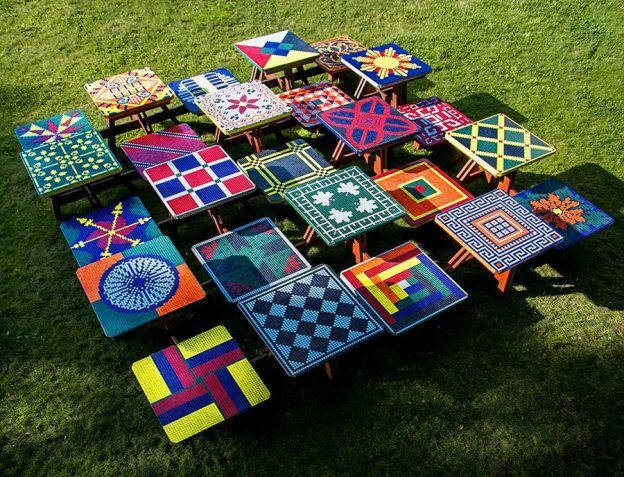 Artist Risa Puno recently completed her interactive mosaic sculpture Common Ground for Rufus King Park in Jamaica Queens, NYC, and the project is a great example for discussing materials and methods for mosaic table tops. Plywood is never an acceptable backer for outdoor mosaic table tops. Humidity in outdoor air can cause plywood to swell, contract, and warp, and even if the displacement is too small to be noticed, it can still cause grout to crack and tiles to pop off. Once grout has hairline cracks, moisture can penetrate underneath, and then there isn’t any hope for the mosaic lasting after that happens. If you have a wooden table that you want to mosaic for outdoors, then attach a piece of 1/4-inch concrete backer board over the top of the wood and mosaic on that. This entry was posted in Improving Your Art, Material and Tool Information and tagged backer board, design considerations, outdoor mosaic, waterproofing on July 2, 2017 by Joe Moorman. Artist Sondra Jonson recently completed a mosaic baptismal font for St. James Catholic Church using our gold glass mosaic and metallic glass tile and vitreous glass tile, and it turned out really well. Religious architecture is supposed to be instructive and inspiring, and so Sondra used a spiral galaxy motif for the bottom of the font and a night sky with stars for the insides of the walls to convey the cosmic significance of the sacrament of baptism. 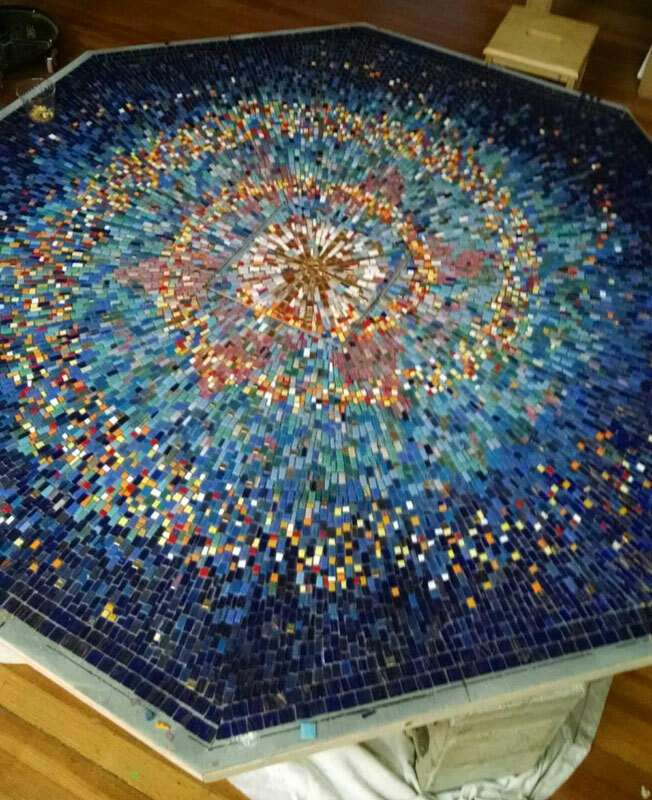 Mosaic Baptismal Font at St James Catholic Church uses a spiral galaxy motif for the bottom and a field of stars for the insides of the walls. 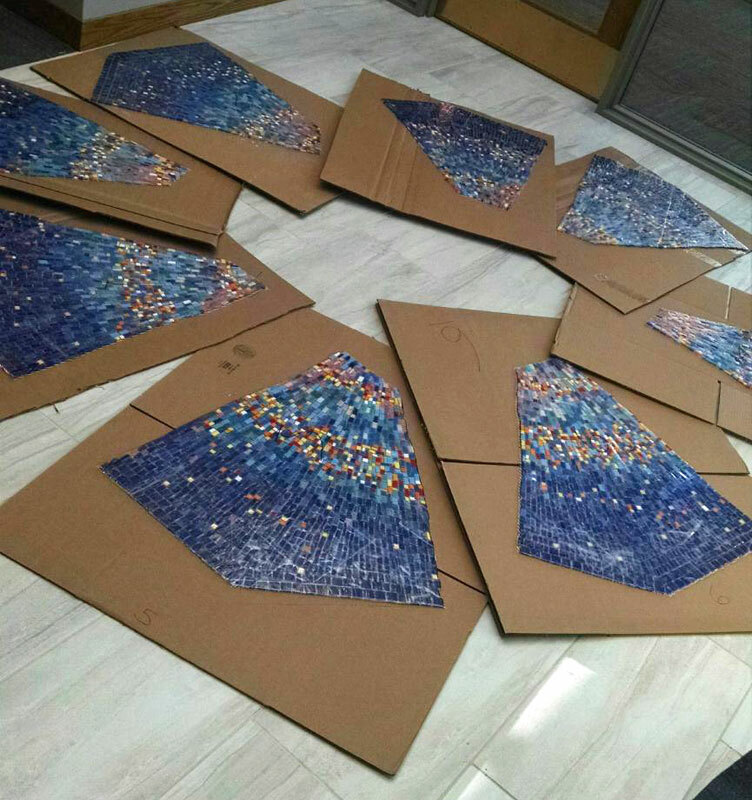 Sondra laid up the mosaic design using mosaic mounting tape, which is recommended instead of fiberglass mesh for outdoor and wet mosaics because glue is used to attach tile to mesh, and glue is vulnerable to moisture. If you use mosaic mounting tape to pick your design up by the faces of the tiles, then you can press the tile directly into the thinset mortar. If you would like to know more, I wrote some instructions for laying up mosaic designs on contact paper and then picking it up with mosaic mounting tape. Mosaic design divided into sections for ease of handling. Note the use of cardboard “trays” to lift the sheets without bending. The clear mosaic mounting tape is on the front of the tiles. Whether you use mesh or mounting tape, you need to minimize the amount of bending and flexing because that can make tiles pop off the sheets. You can use cardboard or plywood panels to lift and transport the sheets. Note that Sondra’s sheets aren’t square for the simple reason that radial sections made more sense than squares because the area to be covered was hexagonal. Mosaic Font Bottom Detail shows how the design was laid up in one piece before being cut into manageable sheets. Write Down The Names Of Your Tiles! 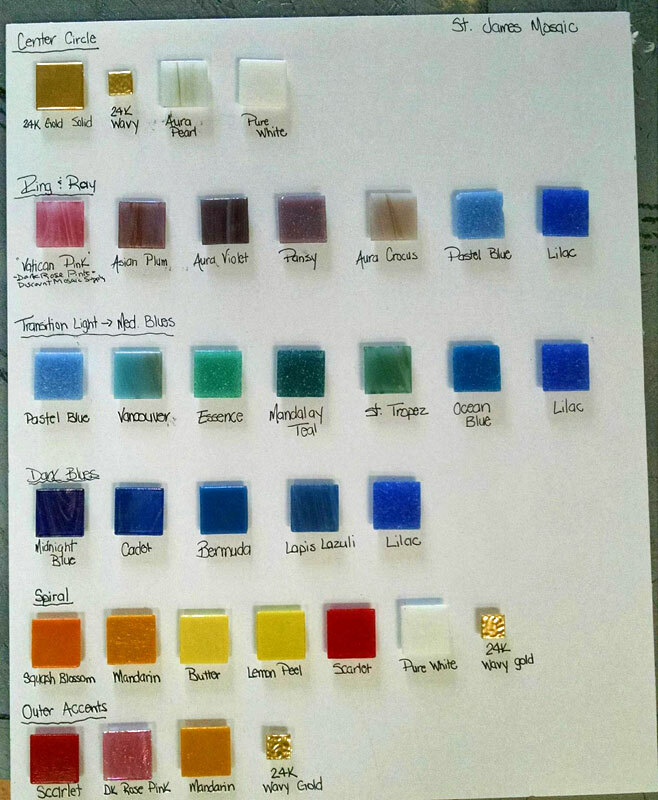 Mosaic Palette Sample Board for the baptismal font project. I cannot imagine installing a large public art project without documenting what materials and sources you used. Even if a product is discontinued or revised, which does happen, you or your client will still have the name and the brand and samples for a photo if you make a board like this on for the project. That is a better starting point for finding a replacement from a different supplier than blurry detail shots cropped from photos of the project, which is what people email us all too often. 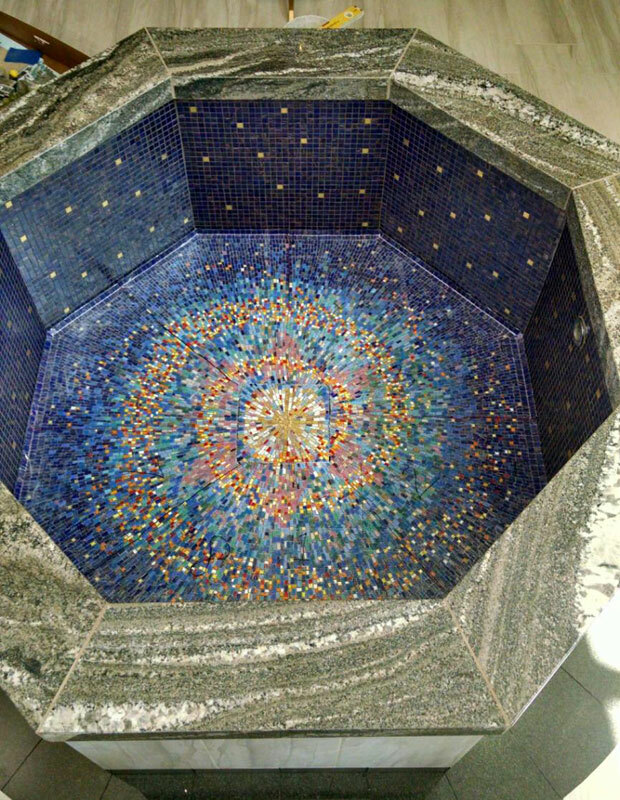 This mosaic was installed using thinset mortar, which is recommended for all mosaics in pools and fountains and other wet locations. I wrote some instructions for using thinset mortar for detailed mosaic artwork if you need to know more for your project. 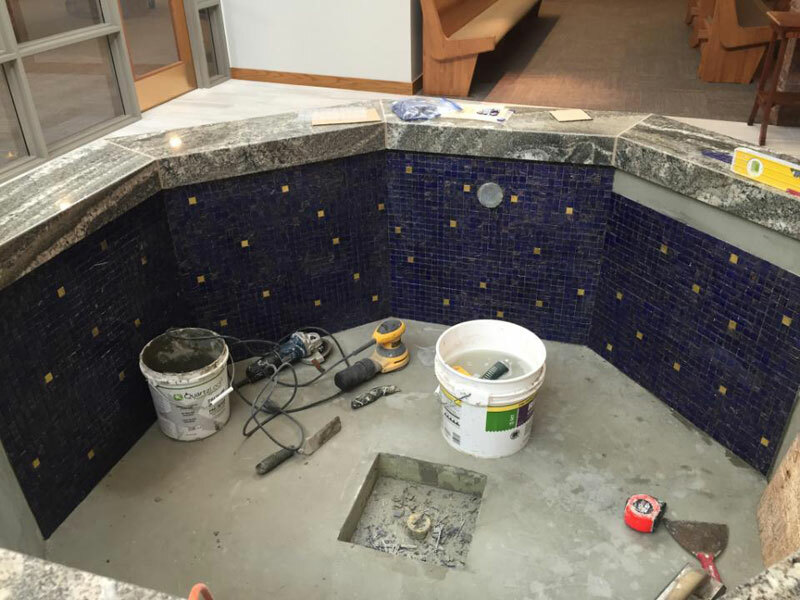 Mosaic Baptismal Font wall detail being installed with thinset mortar. 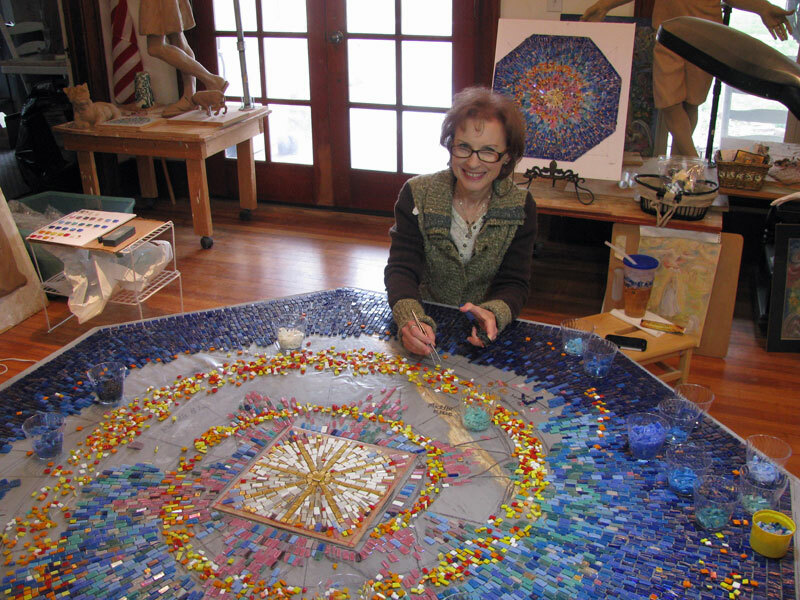 Artist Sondra Johnson working on the mosaic design for the bottom of the baptismal font. This entry was posted in Art Review, Step by Step Instructions and tagged public art, religious art, thinset mortar, waterproofing on May 2, 2016 by Joe Moorman. 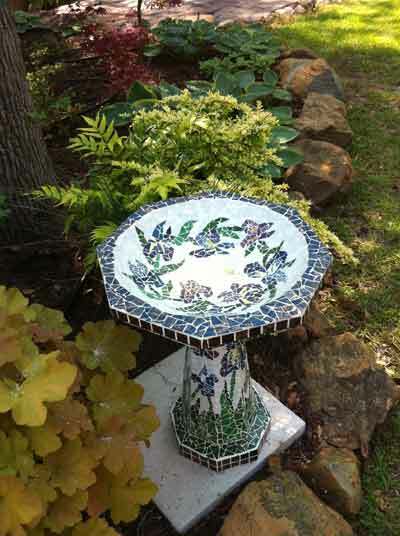 Mosaic bird bath by artist Lyn Richards makes good use of contrasting colors and a Van-Gogh-inspired floral design that help integrate the bird bath with its surroundings. Note the use of an ordinary concrete stepping stone as a footing/base to keep the mosaic work separated from the soil. This is recommended because the acids in decaying organic matter slowly rot stone, concrete and grout. 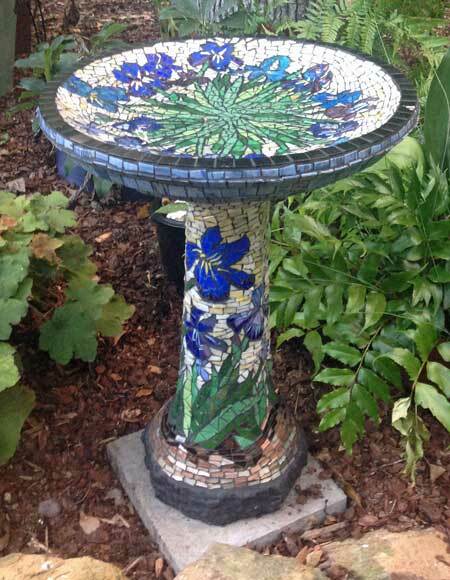 To make a mosaic bird bath such as this, you could use a ready-made concrete bird bath from a lawn and garden center, or you could make an original concrete sculpture if you are looking for something with a less conventional shape. Lyn used a ready-made concrete bird bath that came in two sections: a base column and a bowl. Thinset mortar should be used instead of adhesive for attaching the tile. A complete list of tools and materials for mixing thinset and for applying it is given in my instructions for using thinset mortar with glass tile. (Note the instructions were written for doing extremely detailed work, so I might make thinset seem much more difficult to use than it really is.) I have also written a page for how to keep your hands clean when using thinset. Glass mosaic tile in non-porous and so water can’t get inside it and freeze and crack it all to pieces. This makes glass superior to stone and ceramic tile when used outdoors. You can use any of the glass we sell. Lyn’s mosaic was made from different brands of 3/4 inch vitreous glass tile, metallic glass tile. iridescent glass, and stained glass. To find out how much tile you need, you can divide your shape into component surfaces and use our mosaic tile estimator. What do I mean by component surfaces? For estimation purposes, Lyn’s bath can be thought of as cylinder topped by a disk. The surface area of the cylinder is A = D*Pi*H, where D is the diameter, and Pi is 3.14, and H is the height. The surface area of the disk is A = Pi/4*D*D. Note that this time D is the diameter of the bowl and not the pedestal base. Remember to multiply the surface area of the disk by a factor of 2 because there is a top and a bottom. As always, remember to inflate your estimate by 5 to 10% to account for cutting scrap and to provide a cushion for error in your estimates. 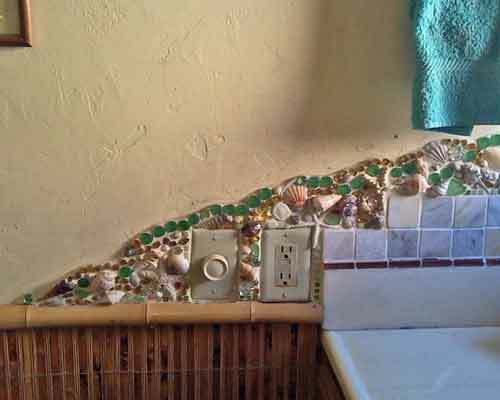 I have always found that it is much better to have tile left over than it is to not have enough. Suppliers sell out from time to time, and the next manufacturer batch might not match what you already have, or at least match exactly. Also, leftover tile serves as inspiration and material for future projects. Lyn used Van Gogh’s painting “Irises” for her pattern. She drew the outline of the shapes (blades and petals) onto the concrete using a pencil, and then she went over that drawing with a black Sharpie marker when she was sure she had her lines correct. This is recommended: Don’t use the marker until I work out my lines by trial and error using a pencil. If your pencil drawing gets to be a mess and you need to start over, you can “erase” it by wet sanding it and wiping it off with a rag. To create a sense of depth and shading, Lyn used multiple shades and hues of green for the leaves of the irises instead of one color. Note how Lyn used multiple shades and hues of green to make the blades of the iris leaves instead of using just one type of green. This creates shade and depth and visual interest and makes all the difference in the world. Monochromatic color fields are boring, and they take just as long to tile as a more interesting mix of colors. Note the solitary pea green blade of new growth and how it stands out from the other leaves, which are a mix of darker and bluer greens. Similarly, the petals of the irises are made from multiple cyan blues and ultramarine blues instead of one color, and this makes them more lifelike and more visually appealing. The background of a mosaic is an opportunity to add visual interest to the scene and should never be “bricked” up like the tiled wall of a shower. Andamento is the visual flow of a mosaic created by arranging the tile in rows, and it can make the background of your mosaic as visually interesting as the figures in the foreground. Lyn’s strong use of andamento creates a sense of motion in the background. When used to its full potential, andamento can make the background as interesting as any figure in the foreground, as demonstrated here. Observe how Lyn used multiple related hues for the background instead of one color. Also note there is not a single whole tile mixed in with all these cut pieces. Why not? A uniform square would stick out like a sore thumb among all the irregular pieces. Thinset is concrete that hardens over time. I can usually get three hours out of a batch, and I often work in sections, usually completing about 1 or 2 square feet per session, depending on how detailed my work is. Lyn found it useful to have her tile cut up in advance of a session, but you can always make incidental cuts as needed while you are attaching tile. Again, my thinset instructions explain the details of how to handle and use the mortar to attach tiles. Tip: partially crushed liquor boxes make great cradles for holding heavy pieces of stone and concrete while you tile them. A marble file or a rubbing stone can by used before the tile is mounted to remove any sharp edges. After the tile is mounted, it is a little more difficult to remove sharp edges, but gently rubbing the surface of your mosaic with a rubbing stone can help a lot. Before grouting, you should clean off any excess thinset from the face of the tiles. Scraping this off will also make any loose tiles fall off so that you can reattach them before grouting. You should wait a day or two before grouting to let the thinset harden. Black grout is best for making your colors stand out. Lyn used a combination of black, gray, and brown grouts, and she blended these to get the exact color she wanted. A few days after your grout hardens, you should buff all the grout haze off and seal the finished mosaic with multiple applications of a silicone-based tile and grout sealer, such as available at any building material store. 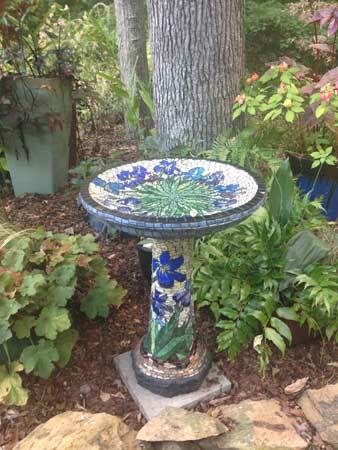 Lyn Richard’s mosaic bird bath at home in her garden. 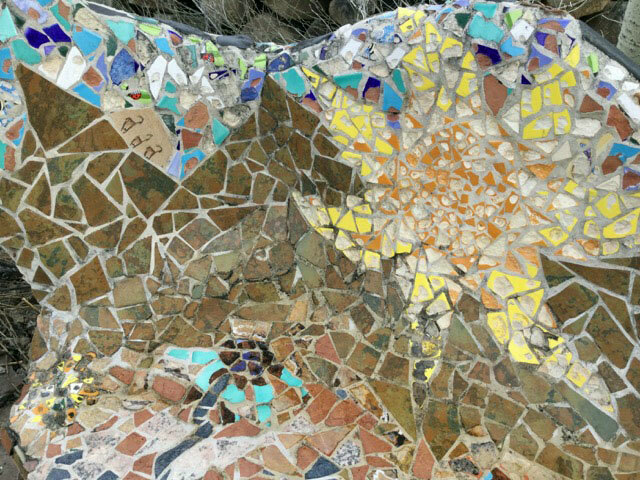 This entry was posted in Art Review, Inspiration and tagged andamento, concrete, nature, outdoor mosaic, sculptural mosaic, waterproofing on April 9, 2015 by Joe Moorman. Terracotta flower pots are highly susceptible to freeze damage because the material is extremely porous. Moisture seeps into the tiny pores, freezes and expands, and then the surface flakes off as shown below. However, it is possible to use terracotta as a mosaic base provided the mosaic is mounted correctly and the artist understands the limitations of the material. Terracotta flower pots are highly vulnerable to freeze damage because they are soft and porous. The damage could have been minimized by sealing the pot inside and out with a tile and grout sealer. Freeze damage can be minimized by sealing the flower pot inside and out with a tile and grout sealer from a local building material store. Tile and grout sealers are silicone products that plug tiny pores and prevent moisture penetration. They can also interfere with bonding, so we recommend sealing the flower pot AFTER your mosaic is complete. Note that even if you do seal a terracotta pot very well with multiple applications of sealant, it still won’t last as long as a concrete pot would. A terracotta pot might be an acceptable base for an abstract mosaic quickly made from random colorful tile, but detailed mosaic designs take more time and effort than that, and they deserve a more durable base. Concrete flower pots and planters are available at most lawn and garden centers, and whatever extra cost is well worth it. 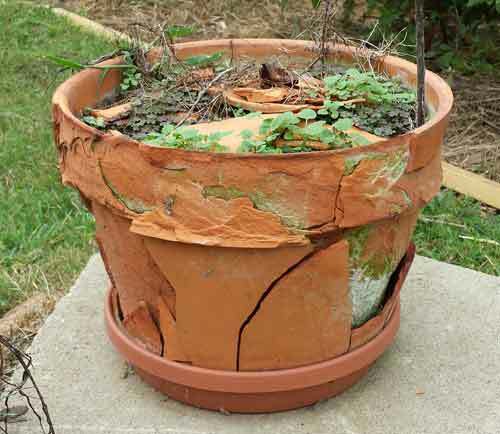 A single winter of hard freezes can totally destroy a terracotta flower pot left outdoors. Also terracotta is also easily broken and cracked during normal use. Sure you might already have terracotta pots at home that you could use for free, but how much money are you saving if the mosaic doesn’t last six months? Once you take the time to mix up mortar and attach the tile, you’ll be glad you took the time to find a concrete base, even if your design is just random tile. The tiles should be attached with thinset mortar instead of glue. White PVA adhesives such as the Weldbond we sell are water resistant when fully cured, but there is a difference between water resistant and water proof. Flower pots are containers full of damp soil, and that means the back of the mosaic will be continually subjected to moisture and acids from decaying organic matter. The acidity of the leach water means that flower pots may be a more extreme environment for mosaics than pools and fountains. 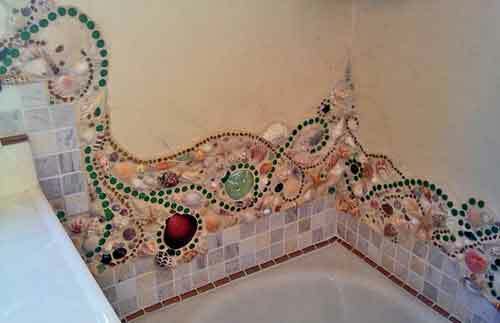 Thinset mortar can also be used to grout your mosaic. Both grout and thinset are powdered portland cement products, but the thinset is stronger and more adhesive. 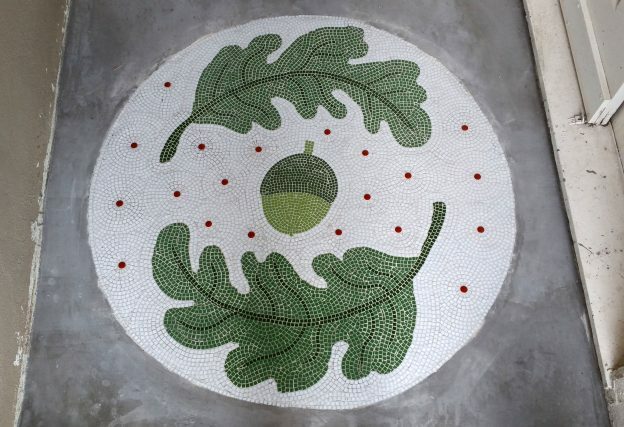 If you are going to have to purchase a powdered cement product to make the mosaic, get the better product (thinset), and use it for everything. You can even reinforce the inside of a terracotta flower pot by plastering it with thinset. This entry was posted in Joe's Rantings, Material and Tool Information and tagged concrete, garden mosaic, outdoor mosaic, restoration, thinset mortar, waterproofing on October 1, 2014 by Joe Moorman. Buy an unfinished concrete sculpture from a lawn and garden center or a store that specializes in concrete lawn sculpture. Make your own concrete sculpture using cement and chicken wire and pea gravel and similar reinforcing materials as discussed on various websites found by searching Google for “concrete sculpture” or our page for how to make concrete mosaic sculptures. Note that my page focuses on a large structural base I was making at the time while some of the other websites have better pictures of how to crumple up chicken wire to make smaller figurines. However, the Internet contains a lot of problematic advice about hypertufa and other practices, so make sure you read my caveats below. Each of these options has advantages and pitfalls that are important to consider before deciding which route you will go. Either way, following best practices to prevent moisture penetration is critical for ensuring the longevity of your mosaic lawn art. 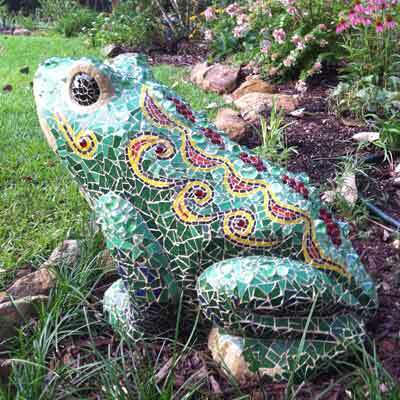 Frog mosaic lawn sculpture by artist Lyn Richards is an excellent example of how you can take a mass-produced concrete base and make it your own unique piece of art by how you tile it. Note how the artist used multiple green hues instead of one monolithic color field and how the greens contrast the reds and yellows, which are arranged in patterns that suggest motion. 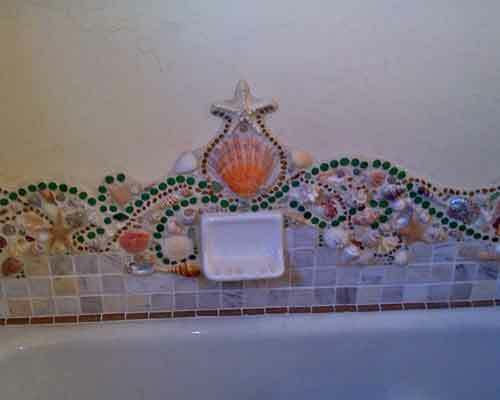 A factory-made base purchased from a lawn and garden center will be identical to all the other pieces made from the same mold, but there is obvious the advantage that you can start mosaicing immediately without having to make the base yourself, which is a complete project in itself and tends to be more labor intensive than expected, unless the artist has worked with concrete before. Also, you can make the generic base into an original work of art by how you tile it, as demonstrated by the artwork by Lyn Richards featured on this page. If a drop of water soaks into the surface of the concrete, there is no excess sealant present, and the thinset mortar used to attach tiles should be able to bond securely. Sometimes you can find factory-made sculptures that have been drenched in sealants, and these can interfere with thinset’s ability to bond to the concrete securely, and tiles could fall off over time. If a drop of water beads on the surface of the sculpture (similar to how water beads on a waxed car), then you know the sculpture is coated in a sealant that should be removed before mosaicing. To remove the sealant, scour the surface with a stiff wire brush of the type used to clean welds (the wires are stiffer and more coarse than those on most wire brushes used to clean barbeque grills). 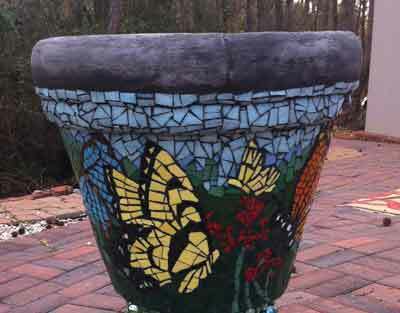 Butterfly mosaic planter by artist Lyn Richards was made on a concrete base, which are much more durable than terracotta planters. Note how the artist used the grout line to add even more detail to the butterfly’s wing. Also note how the black grout makes the colors look even brighter. Sometimes factories will mix expanded perlite or other materials into the concrete to make it weigh less than regular concrete. This is fine in theory, but the expanded perlite is highly porous and mostly air and therefore readily absorbs water. This makes the sculpture highly vulnerable to freeze damage: water seeps in, freezes and expands, and then the surface of the concrete flakes off. If you find a sculpture that appears to be lighter than expected or has a softer or more porous look to it, then coat it all over (bottom included) with a layer of thinset mortar and allow that to harden before you mosaic on it. 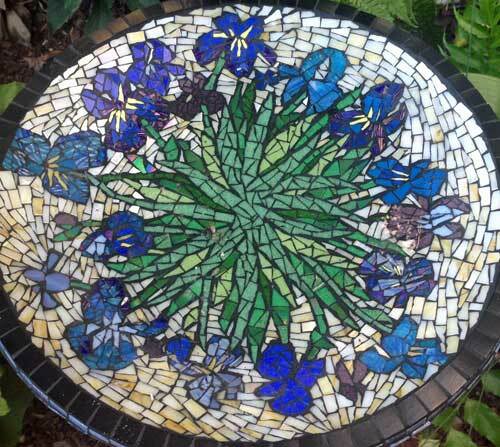 Birdbath mosaic by artist Lyn Richards. Outdoor mosaics on horizontal surfaces tend to have shorter lives as standing water penetrates between the tiles. 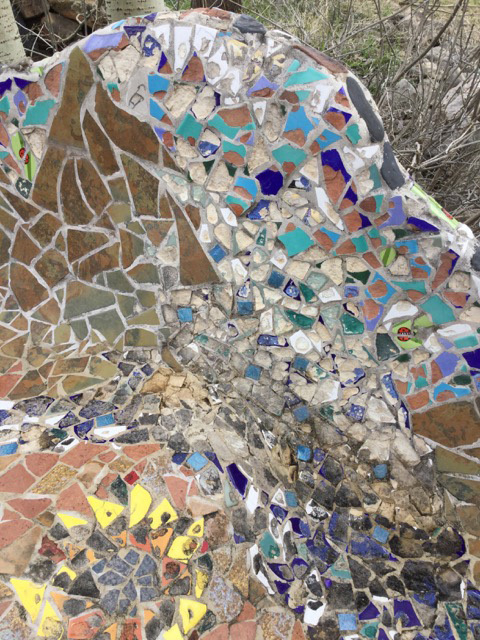 Mosaic benches and birdbaths and other horizontal surfaces should be sealed with multiple applications of a tile and grout sealer to prevent this from happening. You should also consider cleaning and sealing these surfaces every year or two. Mixing up even 5 pounds of concrete can be labor intensive, and mosaic lawn sculptures of any size at all can require 25 to 50 pounds at least. As you might recall from mixing up grout, your arms feel it even with the small batches, and most people will find a drill with mixing paddle necessary to mix up anything over 10 pounds. Several of the websites explaining how to make concrete sculpture emphasize the need to make the bases hollow or to use Styrofoam or harder varieties of expanded polystyrene to fill internal voids. This is good sound advice, especially if you make the surrounding shell of concrete structurally sound by reinforcing it with metal rods and wire. There are different concrete mixtures recommended on the various websites, some of which include glass fibers used to give the concrete the tensile strength it normally lacks. For my concrete sculptures, I used thinset mortar instead of regular concrete. Thinset mortar is like regular cement with sand, but it also has polymers for adhesion and tensile strength. I also mixed in fine pea gravel for additional strength and bulk. The pea gravel was sieved to remove larger pieces and added 1 part pea gravel to 2 parts thinset on a weight basis. Thinset is more expensive than regular concrete, but it is so much stronger, and you don’t have to worry about whether or not it is adhering well to a bare wire frame. Also, if you have to add concrete to a large frame in multiple batches mixed in multiple studio sessions, you can be confident that the fresh thinset is adhering to the thinset that is already hard, and you can’t say that about regular concrete, which is likely to form a crack at the boundary. Of course, the concrete sculpture recipes I saw on various websites recommended different latex additives that should be added to the regular concrete to make it be more like thinset. But my thoughts were why reinvent thinset from different components if I could simply buy thinset, which was actually cheaper by the time you factor in the additives. Also, instead of picking or sieving the larger rocks from a bag of concrete, I thought it made more sense to start with a bag of thinset (which contains no stones) and add the exact size of pea gravel I needed to ensure it fit into my wire mesh frame. Hypertufa is synthetic version of a type of porous limestone called tufa, and it is popular for making custom planters because its porosity is good for plant roots and getting covered with moss and lichens. Hypertufa is made by mixing peat moss and perlite and sometimes other materials into concrete to make it porous and lightweight. About half the post you see on gardening blogs repeat the mantra the hypertufa is completely freeze proof. The other half are asking for advice of how to prevent their hypertufa planters from mysteriously cracking (usually with an acknowledgment that they accept the official dogma that the cracking couldn’t possibly be due to freezing temperatures). What I do know is that all other porous materials I have encountered in my experience with outdoor mosaics are highly susceptible to freeze damage: terracotta, unglazed ceramic, unpolished stone, etc. If it has small holes in it, even tiny microscopic holes, then moisture penetrates and freezes and cracks or flakes the surface. I’m not sure why hypertufa would be any different. The peat moss and perlite are ready conduits for deep moisture penetration. I strongly suspect that hypertufa is so soft that the damage due to freezing and expanding doesn’t result in macro cracks right away, and thus people with weak reasoning skills assume it is freeze proof. Later when cumulative damage finally results in a crack, the crack is attributed to the anger of the hypertufa gods or something like that. 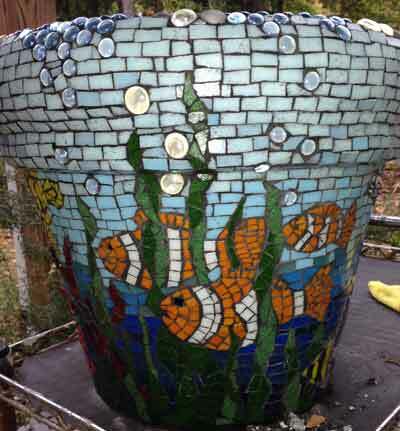 Fish mosaic planter by artist Lyn Richards makes excellent use of glass gems as bubbles. Notice the mixed use of green hues in the seaweed and how the fish and weed are integrated and how they make use of contrasting colors from opposite sides of the color wheel (green and orange). The white makes these colors “pop” even more, as does the black grout. All that being said, hypertufa is fine for someone making a simple un-mosaiced planter and wants it to crumble away slowly like natural limestone. But if you are going to the time and expense of covering it with mosaic tile, then avoid hypertufa. If you want to make a lighter core from concrete mixed with perlite, that is fine, but cover the outside with a layer of thinset before you mosaic to ensure that the vulnerable porous material is protected from the risk of moisture penetration and freeze damage. Like all outdoor mosaic and wet mosaic, the tile should be attached with thinset mortar instead of glue. Other than that, the instructions are more or less the same as our instructions for regular flat panel mosaics. I wrote some detailed instructions for using thinset mortar for mosaic art. You can grout an outdoor mosaic with thinset instead of grout. Thinset is harder and more water-resistant than traditional grout, so it is probably better to use thinset for grouting. Thinset can be dyed with concrete dye. (Note that I am always talking about traditional powered thinset mixed with water and NOT the new epoxy-based systems with a liquid component). I use Versabond thinset in my work, and I have exceeded the dye manufacturer’s maximum recommended amount of dye in the thinset by a factor of 2 without affecting hardness or bond strength in any way that I could notice, but I am sure that it is possible to add too much dye depending on the brand. Tip: Put cardboard on your work table to protect it from the weight and roughness of the concrete sculpture. Tip: Rest the bottom of the sculpture on small blocks such as stone tiles or whatever so that you can mosaic and grout the bottom edge of the sculpture without the surface of the table getting in the way. Tip: Consider sitting your sculpture on some plain concrete stepping stones when you install it in the garden by raising it slightly off the moist soil, you can greatly increase the life of the mosaic, especially the tiles near the bottom edge. Tip: Use a pencil or marker to draw patterns on the surface of the sculpture. Tip: Never use one color blue to make a color field when you could mix two similar blue colors to make the same field of color. It makes the element more visually interesting. 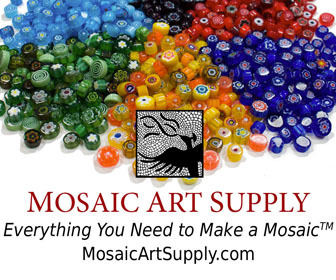 REQUIRED: After your grout has hardened for a few days, seal your finished mosaic sculpture with multiple applications of a tile and grout sealer following the instructions on the package. It wipes right off glass tile and only seals invisible pores. 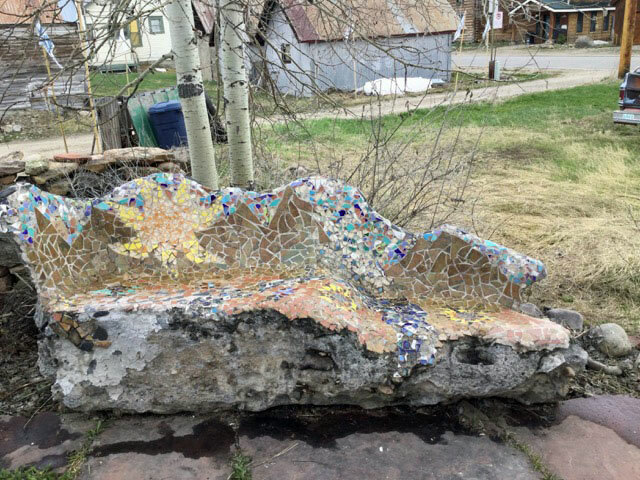 This entry was posted in Inspiration, Step by Step Instructions and tagged concrete, garden mosaic, public art, sculptural mosaic, thinset mortar, waterproofing on September 10, 2014 by Joe Moorman. There are two types of cement board: The first type contains wood fibers or wood particles mixed in with the cement. 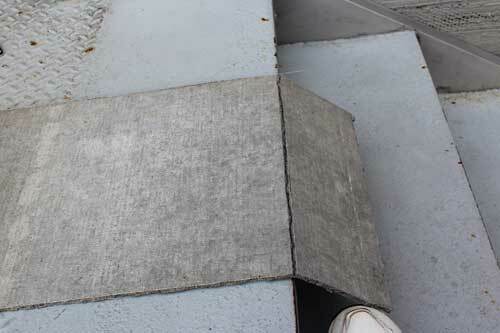 The second type is portland cement between two sheets of fiberglass mesh. The second type is completely water resistant, and that is what we use in our mosaics when we use cement board. There are two methods for cutting cement board: score-then-snap and jigsaw. The score-then-snap is faster and creates less dust, but it can only be used for straight line cuts. The Score-Then-Snap method uses a box cutter to score the board, with the purpose of the score being to cut the strands of fiberglass mesh on that side of the board. A pencil and straight edge (yardstick or carpenter’s square) is used to measure and mark the board before cutting. Cut slowly and firmly to avoid deviating from the line, which happens all too easily due to the surface roughness and the blade snagging on the mesh. Tip: Cement board dulls blades very quickly, so use an old blade and not a fresh sharp one. 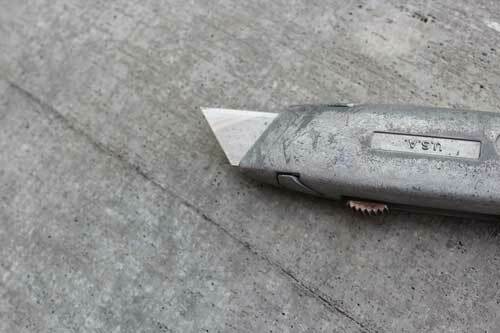 A box cutter is used to score the cement board and cut the fiberglass mesh just under the surface. Make a second pass in your score to make sure all strands of the fiberglass mesh have been cut. Once that is done, the cement board can be snapped with minimal force using the edge of your work surface. You can also slide a yardstick under the board and line one edge of the yardstick up with the score. Pressing down on both sides should snap the board. The edge of a worktable or landing makes a natural place to snap the cement board once it has been scored but sometimes all that is required is to slip a yardstick underneath the score and press down on both sides. The third step is to flip the board over and cut the fiberglass mesh on the back side using the box cutter. Jigsaws can be used to make curved cuts in cement board, but the process does create silica dust, so wear a dust mask. Jigsaws should be run at slow speed to minimize the amount of dust generated. Run the jigsaw at slow speed to minimize the amount of dust you create. Also make sure the cement board is supported and not allowed to flap up and down during the cut. It is possible to damage the board and weaken it by flexing and cracking the concrete. 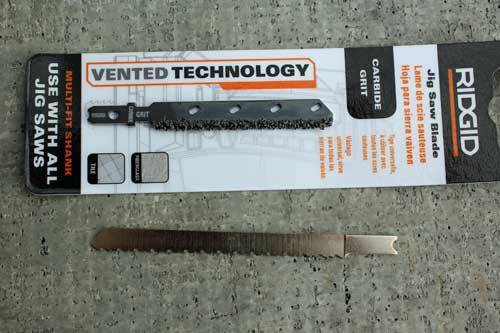 Of course, the blade in the jigsaw should be a carbide grit blade, which is different from the toothed blades used to cut wood and metal. However, if you are like me, you save and “downcycle” everything, and you can use old wood blades that have become too dull and worn out to cut wood cleanly. The coarser the teeth the better. Run the jigsaw at slow speed and be prepared to change out blades when the teeth get worn off, which happens quickly. The carbide-grit jigsaw blade is still in the packaging because it will be returned to the store after the photo shoot. 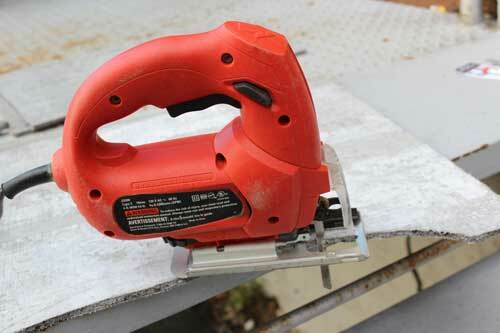 We save our old wood blades when they get too dull and worn out to cut wood and use them on the cement board. Drill the pilot hole in some of the wasted board to be cut out not right on the line of the cut because you are likely to mess up the smoothness of the sink hole if you try to drill your starter hole there. Make sure the board is supported completely underneath when you drill it and not sticking out over the edge of your work surface. The pressure of drilling is enough to flex and bend the board, which cracks the cement. Indoor mosaic plaques and table tops can be made on plywood, but architectural mosaics such as floors and backsplashes and countertops should be made on cement backer board. The reason is simple: plywood can compress, sag and flex over time, especially when the plywood is part of a house with all that implies about exposure to humidity, water and structural stresses over time. 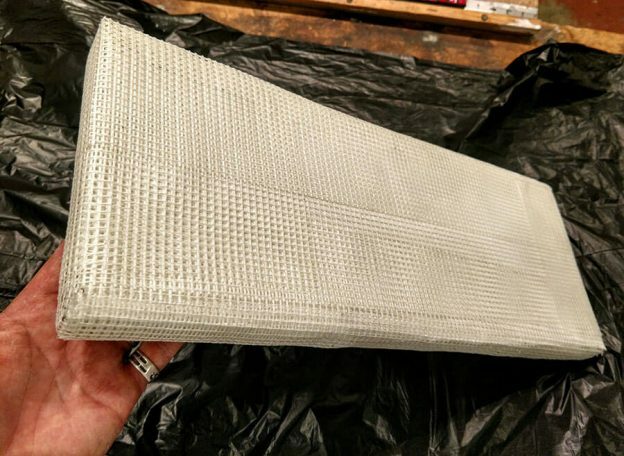 Most of the building material stores I have used (mostly Home Depot in Georgia) carry the fiberglass mesh variety of cement backer board in two thicknesses: 1/4 inch and 1/2 inch. They say you can use 1/4 inch in flooring because the concrete backer board doesn’t supply any structural strength to the floor, but I’ve noticed that the edges of 1/4 inch board tends to get damaged more easily during handling and construction, especially if the tile doesn’t get laid right away. That being said, you might need to use 1/4 inch on your floor merely to save weight. When installing tile floors, make sure you have a carpenter look at the joists under the floor to make sure it can hold the weight of the backer and the mosaic tile. This entry was posted in Material and Tool Information and tagged backer board, outdoor mosaic, waterproofing on October 10, 2013 by Joe Moorman.